With the final episode of Dynasties now aired we take a look at how you can continue the plight of the endangered tigers. In this final episode of the Dynasties series, a tigress named Raj Bhera who lives in Bandhavgarh Tiger Reserve in India holds the perfect tiger territory, with dense jungle, spring-fed ponds and rich grasslands teeming with prey. And now, she has four tiny newborn cubs to care for. They are the future of her dynasty. But the idyllic world that she inhabits is changing. Rival tigers, seeking their own territory, are encroaching on her hunting lands. One, in particular, her adult daughter Solo, is challenging Raj Bhera in the heart of her territory. The powerful tigress must fight to retain control of these hunting grounds while continuing to feed and protect her growing cubs. Solo's persistence puts pressure on the whole family until Raj Bhera makes a decision that could end both her life and her dynasty forever. You can watch Dynasties on BBC One at 8pm on Sundays, or on iPlayer. What do you know about tigers? According to the International Union for Conservation (IUCN) of Nature’s Red List of Threatened Species, tigers are classified as endangered. There are only around 2,154–3,159 tigers left in the wild, and their numbers are decreasing. Tigers are threatened by habitat loss (including for palm oil plantations in Indonesia), human-tiger conflict, and poaching for the illegal trade in tiger parts and products. Tigers are found in Asia, in the tropical forests, shrublands and grasslands, but they are also found in the cold, snowy climate of the Russian Far East. The smallest tigers are found in Sumatra (around 120kg for a male), and the largest tigers are found in the Russian Far East (160–190kg for a male). The taxonomy of tigers has received much attention. Until recently, six extant subspecies of tiger were recognised including e.g. 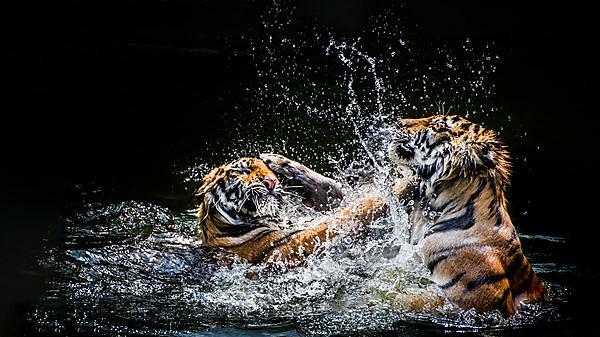 the Bengal tiger and Amur tiger. In 2017 the Cat Classification Task Force of the IUCN/SSC Cat Specialist Group revised this to just two subspecies: Panthera tigris tigris and Panthera tigris sondaica. Whilst tigers can roar, unlike lions they do not roar very often. Tigers more commonly make other vocalisations that are often described as moans, coughs and grunts, including the close range prusten or “chuffing” sound made in friendly situations. Tiger stripe patterns are unique to individual tigers and can be used to tell them apart. It can be difficult to identify individual tigers, but the cheeks, the area above the eyes, shoulders, thighs and tail are the best parts of the body to use. Part of our course research looks at the behaviour of tigers in zoos, particularly focusing on patterns of behaviour related to feeding routine and anticipation of feeding time. Our MSc in Zoo Conservation Biology is jointly run by Paignton Zoo, where students can study many animals including tigers. In the second year, BSc Animal Behaviour and Welfare students can go on a field course to zoos in The Netherlands, where they study zoo animal welfare. Previous Zoo Conservation Biology MSc students have carried out projects including investigations into tiger vocalisations, studies into tiger feeding schedules and reviews of feeding practices for zoo-housed tigers and other carnivores. Dynasties may have drawn to a close, but it has left an impact on many who watched the beautiful and sometimes harrowing scenes. Until the next epic television production by Sir David Attenborough and his team, we will take away as many memories from the series as possible. Once again, we have been reminded of how humans are affecting the future of the earth's resources and its wildlife. If you feel like you want to help shape the future of our planet and help to conserve the environment and its species, the University of Plymouth offers a wide range of courses tailored to making your goals and aspirations successful. From animal behaviour and welfare to biological sciences and marine biology, zoo conservation biology as well as conservation biology, the University offers courses for everyone with a passion for animals, the science behind the welfare and film & television production. Why not read about our alumni, who have already taken those steps to the career of their dreams, whether that's helping to conserve our vulnerable species, finding ways to protect their habitat or capturing the magic from behind a camera. Our programme equips you with the skills needed to build a successful career in wildlife conservation. The unique blend of zoo-based learning and academic teaching delivers the vital knowledge and understanding needed to thrive in this competitive arena. Are you inspired to learn more about studying animal behaviour and welfare? Please visit the BSc (Hons) Animal Behaviour and Welfare course page to find out how we can help you shape your future. You can also find out more about our range of courses within the School of Biological and Marine Sciences. Why not discover what other alumni are currently doing within the biological, health, chemical and agricultural sciences interest area? Are you passionate about biology in all of its forms? Do you want to study a broad biology degree without the constraints of choosing a specialism too soon, with equal emphasis on lab and field skills? We can help you to build an understanding of biology from viruses to mammals, gaining state-of-the-art practical and transferable skills highly sought by employers, graduating ready to shape the future of fields from ecosystem management to laboratory research. Find out more about our School of Biological and Marine Sciences. They took the opportunity, why don't you? "Find something you love and pursue it. This is what I did. This is my story of how my passion for animals as a child grew into a fulfilling career that allows me to help rescued bears across the world." Lianne's dream placement to China inspired her to save moon bears held in captivity and after graduating from Plymouth, she began working in the UK offices of Animals Asia in 2017 as a Senior Supporter Care Executive. After graduating, Nicky Stander relocated to South Africa where she now works as seabird rehabilitation manager in Cape Town. "The most exciting adventure was arriving in Botswana during my gap year. It was a culture shock! I had the most amazing wildlife experiences; working with cheetahs, wild dogs and I experienced human-wildlife conflicts. A highlight was when I helped to hatch African penguin eggs and, after rearing, released them into the wild." @ Fibres, fashion and the oceans - what is the impact?